This piece discusses major plot details of Zootopia and Wreck-It Ralph, including the endings of both films. The nature of personal identity, and the eternal question of how much we can do to change our own identities, is burrowed at the core of Disney’s newest animated film, Zootopia. No doubt, a veritable deluge of virtual ink will be spilled regarding its unexpected but welcome message about the racial divide in modern society. 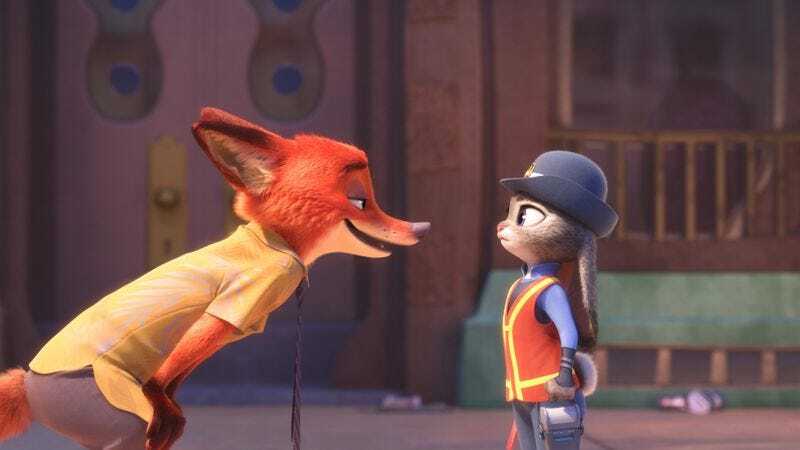 The focal relationship in the film, between self-proclaimed “sly fox” Nick Wilde (voiced by a typically, appropriately smug Jason Bateman) and “dumb bunny” Judy Hopps (Ginnifer Goodwin), is initially based on rank stereotyping, much in the same way that buddy cop comedies like Lethal Weapon or 48 Hrs. rely on racial differences to fuel the combustible connections between their heroes. But as a surprisingly committed mystery involving a series of disappearances and savage transformations unfolds around Nick and Judy, Zootopia reveals itself as an inversion of one of Disney’s other recent animated films, Wreck-It Ralph. Zootopia, like Wreck-It Ralph, owes a creative debt to the early work from Pixar Animation Studios, whose head honcho John Lasseter now works as a top advisor at Walt Disney Animation Studios as well. (One article noted that when the concept for Zootopia—basically just the real world, but with anthropomorphized animals only—was pitched to Lasseter, he was so thrilled that he lifted the idea man, co-director Byron Howard, in the air like Simba in the “Circle Of Life” scene of The Lion King. Oh, to be a fly on the wall for that meeting.) These films create environments out of whole cloth; Wreck-It Ralph’s idea of video-game characters having lives of their own when humans aren’t looking is similar to the conceit of Toy Story, while Zootopia’s anthropomorphized citizens recall the denizens of the human-free world of Cars. Both films have a mismatched-buddy-comedy sensibility: In one, a rabbit and fox put aside their differences to be friends; in the other, a villain and a sugary-sweet princess do the same. The central characters also struggle to be perceived by others as more than their stereotyped role: Ralph, from the first scene, wants to be seen as more than just the “bad guy,” and Judy wants her minute stature and genus to not deter anyone from seeing her as a serious police officer. Where the two films differ, to Zootopia’s immense credit, is in the resolution of these arcs. By the end of his story, Wreck-It Ralph learns that wanting to be more than his identity of building-crushing villain would cause the destruction of his life, and the lives of every other video game character in the arcade where his game, Fix-It Felix Jr., is housed. In the climax, Ralph commits an act of sacrifice both to end the chaos he inadvertently created by jumping into another game, as well as to save his friend, the playfully obnoxious Vanellope Von Schweetz, from the Sugar Rush racing game. He dives from the clutches of a hybrid human/alien insect to cause a fatal explosion while reciting the mantra of Bad-Anon, the villain support group he attends on his off time: “I’m bad, and that’s good. I will never be good, and that’s not bad. There’s no one I’d rather be than me.” When he first hears the mantra, Ralph rebels against the notion of his predestined role; when he utters it in the finale, he’s embraced the slogan’s tenets fully. Ralph survives this leap of death, of course, and winds up treated with less disdain by the other occupants of Fix-It Felix Jr., who previously ostracized him from their fun dance parties. But he’s still the bad guy: His role is outside of his control, and trying to change that, as the mantra suggests implicitly, would be bad. The only difference between the opening and closing scenes isn’t that Ralph gets tossed in the mud; it’s that he smiles before being hurled off the building. Judy Hopps, in many ways, seems like she might be on a similar journey from the opening scenes of Zootopia (a film co-directed by Rich Moore, who directed Wreck-It Ralph). Everyone in her small town of Bunnyburrow, even her well-meaning parents, scoffs at, or flatly doubts, her dreams of becoming a police officer in the big city of Zootopia; only predators work as police officers, not any prey, even if the latter comprise 90 percent of the Zootopian population. Judy faces adversity even after her dream, on a surface level, comes true, thanks to being part of a Zootopia Police Department diversity initiative: Her first assignment turns her into a glorified meter maid, writing parking tickets from dawn to dusk. Initially, Judy attacks the lowly job with a Leslie Knope-esque brio, dedicating herself to writing 200 parking tickets by lunch, barely breaking a sweat in the process. The not-exactly-Herculean task is offset by her parents’ ecstatic joy when they realize she’s been placed in the safest possible scenario by her ZPD superiors. Yet Judy is convinced, as Ralph is, that she’s destined for greater things; where he attempts to get a medal to prove his heroism, she sweetly strong-arms her way into taking on a seemingly unsolvable case, of 14 mammals of varying breeds who have mysteriously vanished across the dozen landscapes of Zootopia. But her boss gives her an ultimatum: If she doesn’t solve the case within 48 hours (of course! ), she’s fired, putting a dent in that diversity initiative. Though Judy has a longtime loathing of foxes—she could be wary of many other predators, but she carries a fox-specific repellent on her at all times—her only lead is Nick, a low-level criminal. Nick’s connections to the underworld help the duo discover that the disappearances are tied to a larger, more troubling question: What if the predators of Zootopia devolved to their original state, where they no longer walk upright and try to attack any prey they can find? While this question relates heavily to issues of racial stereotyping—Judy chides a fellow cop for calling her “cute,” a word bunnies can use to describe each other, but not one that other species should use, and her own stereotyping of Nick becomes a conflict in the third act—it also ties to the notion of identity. Can we be more than the stereotypes people see when they look at us? Wreck-It Ralph, if its ending is any indication, suggests it’s not possible to change our identities; Ralph is always going to be a villain, and Fix-It Felix Jr. is such a good guy that he’s literally unable to break anything, even when throwing a tantrum in a prison cell. Zootopia, on the other hand, doesn’t invalidate Judy’s dreams, nor Nick’s journey to goodness. Before their inevitable falling-out that kickstarts the third act, Judy convinces Nick that, for all his shiftiness and criminality, he’d make a hell of a police officer. Neither a rabbit nor a fox would seem to have a place on an animal police force—the other animals on the ZPD range from a cape buffalo to an elephant to a rhino—but they wind up as literal partners in the final scene. Judy and Nick, like Ralph, have preordained identities as soon as they’re introduced; the opening takes place during Judy’s childhood, immediately presenting the rabbit-fox conflict as she’s bullied and thrown to the ground viciously by a nasty neighborhood fox. The dichotomy is simple: Rabbits are timid, and foxes terrorize them. But animal-based stereotypes are shaky among all of the characters. One of the cops on the ZPD force (voiced by Nate Torrence) is a chubby cheetah with an outrageously sunny disposition; he’s more at home imagining himself as a lithe dancer in a music video with a pop star/gazelle voiced by Shakira, than as a fearsome beast. (The ZPD chief, the cape buffalo voiced by Idris Elba at his grouchiest and most English, has a similar predilection, further proving that looks aren’t always what they seem.) Zootopia, on the whole, does the opposite of Wreck-It Ralph: The earlier film reinforced stereotypes, where this film upends them consistently. Even the resolution to the mystery represents a twist based on presumptions of what predators and prey are capable of accomplishing. First, the culprit appears to be Zootopia’s mayor, a lion with J.K. Simmons’ stentorian tones; though he turns out to be something of a red herring, he’s guilty of covering up the disappearances and how the mammals reverted back to their savage nature after being exposed to a poisonous flower. The true baddie—lining up with Roger Ebert’s famous Law Of Economy Of Characters rule—is Assistant Mayor Dawn Bellwether, a seemingly meek sheep (Jenny Slate) whose poor treatment by her superior has curdled her frustration into vengeance. By forcing predators back an evolutionary step, she’d rule Zootopia instead of being treated like a glorified secretary with a broom closet for an office. Dawn sees in Judy a comrade-in-arms, as their diminutive status suggests pure, unfiltered weakness to those who literally loom over them. Though their paths diverge, both Dawn and Judy are driven by the desire to subvert their own identities, if not those around them. Wreck-It Ralph is a film about confirming and reconstituting the status quo: Ralph returns to his house on the dump adjacent to the apartment building at the center of Fix-It Felix Jr. by the film’s end, and Vanellope returns to her status as the princess of Sugar Rush. They may enjoy lobbing playful insults at each other, but they don’t fundamentally change. Conversely, in Zootopia, almost everyone changes by the end. Judy and Nick are now both cops, and Judy has garnered respect from her commanding officer, as well as her family and Nick himself, whose reliance on stereotyping is based on a traumatic childhood event that convinced him to confirm other animals’ bias against him instead of change their minds. As is often the case for Disney animated films, these films’ lead characters are driven by re-establishing their identities to the worlds they inhabit, but the presumed success in Wreck-It Ralph is anything but, with the lead character accepting his one-dimensional place in life. Zootopia, in line with its presentation of how difficult but necessary it is to achieve a societal unity, argues that it is possible for a bunny and fox to be more than just dumb or sly.